Punjab Chief Minister Mr. Parkash Singh Badal’s approval to constitute a ‘Think Tank’ for agriculture sector will act as a bridge between the farmers and the policy makers to redress the problems faced by the farming community, which forms the backbone of primarily agrarian economy of the state. The move is historic as for the first time the farmers will have an official say in the drafting of the policies related to agriculture and its allied activities. This proposed organization, on lines of FICCI, CII and others for industrial and commerce sector, was all set to act as catalyst for promoting agriculture and allied farming sector. To be constituted with the representatives of agro-experts, progressive farmers and others this upcoming organization will be exclusively a farmers’ organization that will mull over the various aspects related to the welfare of the peasantry besides suggesting ways and means to the policy makers for making agriculture a far more profitable venture. The new farmer friendly platform will have complete autonomy to sort out varied issues related to the welfare of peasantry including creation of awareness amongst farmers for adopting the latest farm practices and assured marketing support for purchase of their produce at remunerative prices without any exploitation. The progressive farmers from agriculture and allied farming like dairy, fisheries, honey, piggery, floriculture, horticulture etc. as representatives of this farmers’ chamber will have a fixed term so that maximum number of such progressive farmers could be accommodated in rotation so that they could espouse the cause of farmers to their satisfaction in a free and fair manner. The proposed organization will continuously dwell on the various issues confronted by the agriculture sector, policies of agriculture across the globe with thrust of national agriculture policy and that of various states besides issues of production, marketing and research. Like various industrial chambers this farmer’s chamber will appropriately suggest the steps that the state and Centre government must take for ensuring the well being of farmers at every cost. Similarly this organization would act as a custodian of the rights of the farmers by raising the farmers issues at the various levels. This ‘Think Tank’ will be provided with necessary infra structure support including space for official accommodation and the state government has already zeroed in space at SAS Nagar (Mohali) for setting the office of this organization. Likewise the organization will also be granted a corpus fund by the state government to make this upcoming organization self sustainable and economically viable. The entire purpose of setting up of this ‘Think Tank’ is to ensure that well being of the farmers was ensured through extensive research and deliberations between the farmers and the policy makers. 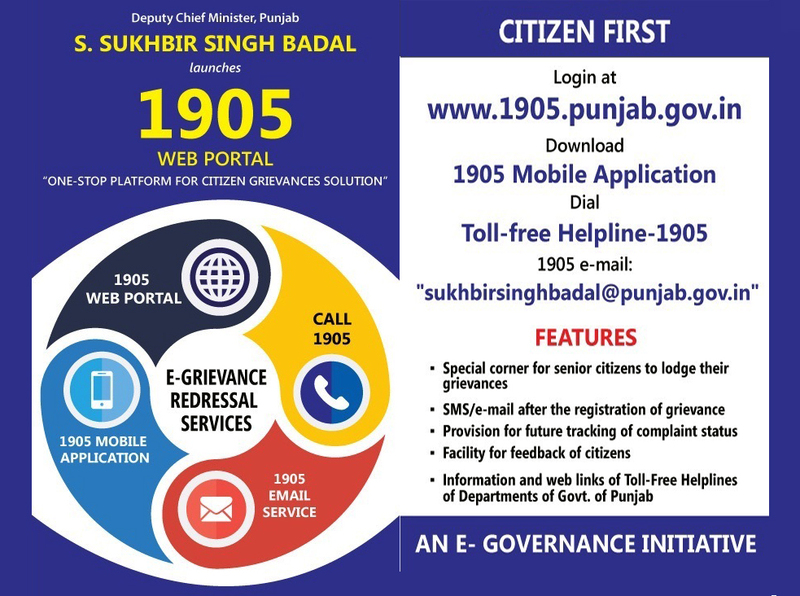 After successful implementation of Deputy CM’s toll free 1905 helpline, email sukhbirsinghbadal@punjab.gov.in, Punjab government has launched 1905 web portal 1905.punjab.gov.in and mobile application for citizens of the state to register their grievances online besides tracking complaint status and giving feedback. 1905 mobile application and web portal 1905.Punjab.gov.in are providing single platform to citizens of the state to lodge their grievances regarding different departments of Punjab Government. 1905 web portal also has a special corner for senior citizens to lodge their grievances which offers better and effective monitoring of their grievances. This web portal has provision of citizen feedback for all Departments’ Helpline, Information about the Helplines of the departments and Web Links of the concerned department’s grievance portal. Mobile Application 1905 also has all the features of the 1905 web portal. From receipt of grievances from citizens, receipt of reports from Departments to final disposal of the grievance, all processes are system enabled. Structured formats for registering grievances have been provided in the web portal and app for 10 departments and Key areas in each department would be identified soon. To ensure the efficiency of grievance redressal system every department has a nodal officer in 1905 helpline system and the meeting of these officers held every month. The main aim is to have focussed receipt of grievances and it would help in understanding the areas of government departments from where grievances are originating. It would also lead to consequential governance reforms in those areas. The Punjab Revenue department has taken major pro-people initiatives in the form of launching a comprehensive 24×7 helpline (168), further lowering the limit of e-stamping certificates to Rs. 20,000/-besides spending Rs. 250 crore for upgarding the present infrastructure by undertaking construction of seven District Administrative Complexes (DACs) and 20 Tehsil Complexes during year 2015. Besides this, the gigantic task of total computerization of revenue records is almost complete as 164 computerized Farad Kendras covering 12958 out of total 13001 villages, are providing farad copies in less than 15 minutes. Under the dynamic leadership of Revenue Minister Mr. Bikram Singh Majithia, the new initiatives in the form of 168 helpline and E stamping have resulted in more transparency and accountability in the Revenue department. The information on land records has virtually comes on the finger tips of every individual around the globe with this helpline, which has been divided in three parts as in first part one can seek information regarding land records and registration of deed. In the second part, anyone by simply making a phone call get latest information/update regarding various cases in Revenue department, information regarding solutions to problems being faced with Revenue department besides latest information about the mutation, transfer of khasra girdawri & demarcation of land. Similarly, in third part one can register his complaint regarding Revenue department and any Revenue officer. Inquiry/Status/Complaint is being registered and a unique number is provided to the caller. The decision of implementing e-stamping has resulted in cost savings and it being a user friendly, the authenticity of e-stamps certificates could be checked any time anywhere. The Punjab government has recently decreased the limit of issuance of e-stamp certificates for registration of properties from present limit of Rs. 50,000/-to Rs. 20,000/-. This decision has authorized the Stock Holding Corporation of India (SHCIL) to issue e-stamp certificates for amount exceeding Rs. 19,999/-. Similarly, the state government has also waived off total registration fee charged for transfer of property between spouses and blood relations in urban & rural areas thereby giving a big relief to thousands of such beneficiaries. In a special gesture to encourage families to legally transfer property between blood relations and spouses including son, daughter, father, mother, brother, grandson and granddaughter, the Punjab government also waive off of social security fund, social infrastructure cess and stamp duty on such transfers. With this significant decision, the SAD-BJP government had fulfilled the long pending promise of SAD-BJP government regarding zero transfer fees on such transfers. The State Revenue department has also enhanced the honorarium of Numberdars from Rs. 1000/- to Rs. 1500/- per month. Besides this, the State Revenue department has also provided special disaster mangement training to 1,30,000 students by selecting 100 students from 100 schools each in 13 districts and 65,000 villagers to tackle any eventuality. The department has also started working on capacity building by preparing District Disaster management Plan (DDMP) and State headquarters and State Disaster Management Plan(SDMP) and IDRN data of state has been uplaoded. Punjab Armed Police, Jalandhar has been released Rs. 1.55 crore for equipments required for search and rescue operations and Local Bodies department has been issued Rs. 45 lac for firefighting equipments.